Green Mount Cameroon!! Trees Soon To Be Ready For Planting!!! So far, the project has seen the training of community members on tree nursery management and trees propagation which was intended to impact them with the knowledge needed to maintain a steady supply of tree seedlings to these communities and their environs. Tree nurseries have also been established for these communities. The nurseries will not only supply the tree for planting but will also serve as hand-on training grounds for the community members who were trained during the workshop on Trees propagation and nursery management. The nurseries are also open to other community members and institutions who go there for the purpose of learning. So far, more than 1000 trees have been nursed and will soon be ready for planning during the month of June 2017. The tree types were chosen based on the demands of the communities involved. While some wanted trees for their catchment protection, others wanted just ornamental some wanted medicinal tree and so trees suitable for all these purposes were collected. Care was also taken to select some agroforestry species that can be planted in farms and will serve as organic fertilizer to the farmers. It is expected that after satisfying the need of these 3 communities, the project will be opened to other communities around Buea to benefit on the condition that they do an under taking to the effect that they will properly take care of the trees they will be given and ensure that more than 80% of them survive. Green Cameroon is therefore calling on other communities around Buea that are interested in the planting of trees to indicate interest starting from the 1st of July 2017. To do this, they can either write to Green Cameroon through E-mail or come to our head office in Buea town were arrangement would be made to enable them have trees for planting. Green Cameroon wishes to thank the Yohan Kimberly University and Eco-Peace Leadership Center for financing this project and also the Ministry of Environment, Nature Protection and Sustainable Development for their support and advice during the training workshop and project implementation face. 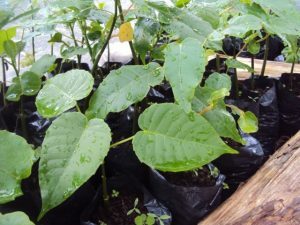 It is hoped that in the near future there will be a steady supply of trees to replenish those cur down on a daily bases leading to sustainable management of the Mount Cameroon forest Ecosystem. ← Green Mount Cameroon Project 6 Months Now! My name is Ademola and i am an agriculturist based in Nigeria. Your timely response will be appreciated.